On Monday I visited the Rideau Centre Mall while waiting for my wife to finish work for early on Christmas Eve. We were planning an early dinner but I was hungry and decided to find a snack in the food court to tide me over. 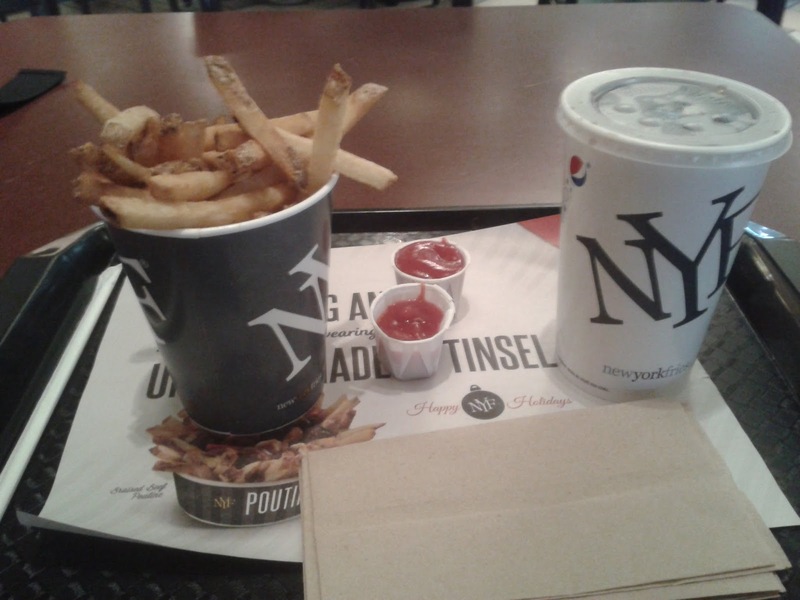 New York Fries was a staple when I was hungry and needed a snack at the Upper Canada Mall Food Court in Newmarket. I visited the New York Fries (50 Rideau Street, Ottawa) at 11:30 A.M. to find no line up and some people in the food court eating their lunches. Not a bad day at the mall considering it was Christmas Eve and harried shoppers were expected. Turned out the mall was like a regular Saturday, more shoppers than a regular weekday but not overly stuffed like a typical day before Christmas. Without a line up I placed my order immediately. I payed for my order ($6.43 including taxes), retrieved my food, ketchup and napkins and then ventured to find a table. Tables were easy to come by as it is before the normal busy time of noon. After noon on a regular day at any mall food court you are lucky to even find a table. I sat down and review my order. I scratched my head at what I saw. The fries size seemed to have shrunk along with the fountain sized drink. The price, of course, had risen. I scratched my head if McDonald's across the street would have provided their extra large fries and drink for a better price. Size wise, for the price New York Fries was charging it was quite disappointing. I shrugged and dug into my fries to see if New York Fries had redeemed themselves by ensuring it tasted the same or better than before. Nope, same taste but the fries were luke warm at best. Perhaps this was because customers at this point seemed scant thus the fries made were sitting longer. Taste wise the fries hadn't changed from those of yesteryear but by today's standards were nothing special. The fountain drink was mediocre, just like you would find at any of the other food establishments in the Rideau Centre Food Court. Overall, New York Fries has upped their prices over time but seemed to have shrunk the sizing of the fries and drink containers. The fries have stayed the same with the rest of the restaurant establishments upping their game in this department. New York Fries hasn't changed from the 1990s only the prices have gone up and the sizes seemed to have gone down. The Big Apple would never approve of smaller portions or not upping your game. But then again "New York" Fries doesn't have a location in New York City now do they? Hard to name yourself after something big when you have fallen into overpriced mediocrity.